Gulf Shores Boat and Paddlesports Rental: Fun for Kids in Orange Beach and Gulf Shores, AL: Paddle Boarding! 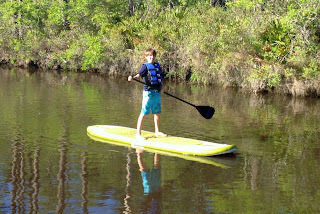 Fun for Kids in Orange Beach and Gulf Shores, AL: Paddle Boarding! Stand up paddleboarding (SUP) is one of the fastest-growing and fun activities for kids in Gulf Shores and Orange Beach, AL. Paddle boarding is safe, easy to learn and will keep your kids active and entertained for hours while you enjoy the beach! Plus, paddle boards are a great way for your family to explore new areas of the Alabama coast you've probably never seen before. Our inland waters offer thousands of hidden saltwater creeks and bays to discover - many not accessible by boat - filled with beautiful scenery and amazing wildlife. You might even get an up-close encounter with a dolphin - something you'd never forget. Rent a paddle board and we'll deliver it to you - and pick it up when you're done. Affordable daily and weekly rentals are available, so call today!